Some native plants get all the love. Purple coneflower (Echinacea purpurea) is a rock star in the garden world, and nurseries have developed all sorts of colored cultivars from it. Oakleaf hydrangea (Hydrangea quercifolia) is a much-appreciated native shrub that is popping up in all kinds of designed landscapes. 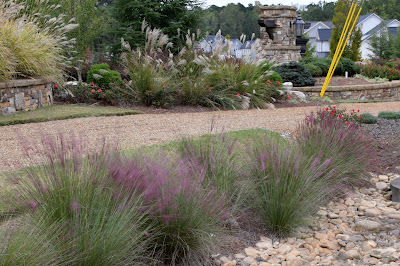 In the world of ornamental grasses, pink muhly grass (Muhlenbergia capillaris) is getting a lot of attention these days. Whatever is being sold, now is the time to notice it in landscapes as its tall spires of pale to deep pink inflorescences wave in the breeze. I’m seeing it in new landscapes, such as completely new construction areas like new subdivisions where it is planted in the main entrance or in the landscaping of the new homes. Many of these new areas lack mature trees and so have bright, sunny areas that are perfect for ornamental grasses. A large sweep of this grass makes a bold statement when it blooms in October, just as flowering perennials might be diminishing. I am also seeing it in road medians and interchange landscaping (two areas where it is hard to safely take a good photo). In John’s Creek, there is a fabulous median strip near Sargent Rd that has muhly grass, beautyberry (Callicarpa americana), and dwarf wax myrtle (Morella cerifera) mixed with some non-native landscape plants. On GA 400, exit 6 near Dunwoody/Sandy Springs was recently landscaped with a lot of muhly grass. A creamy-colored cultivar by the name of ‘White Cloud’ is also starting to get more use. I think it lacks the impact of the pink flowering one, but perhaps some people don’t like as much pink. 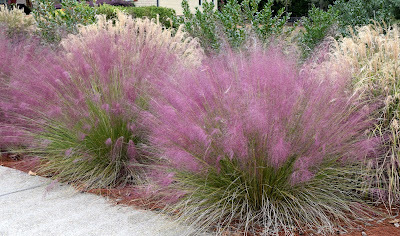 You can buy muhly grass in stores and online nurseries and even places like Amazon and Etsy (I do like local native plant nurseries when possible). It does best in landscapes where it can get full sun and good drainage. In the spring the old foliage can be clipped. In natural areas, the occasional use of fire probably benefits it, but residential usage should probably stick to traditional pruning for good health. 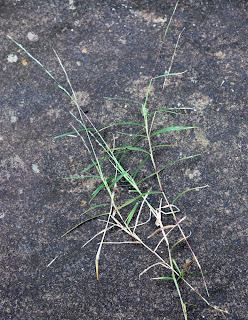 I'd like to point out a smaller but perhaps more widespread perennial relative known as nimblewill (Muhlenbergia schreberi). This native grass grows up to 18 inches, but sprawls on the ground later in the year where it might root from the nodes that touch the soil. 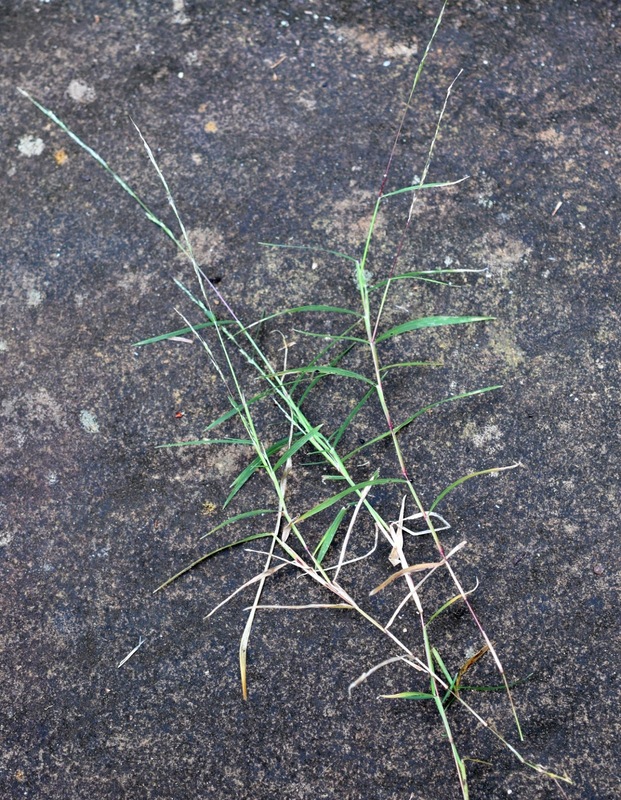 When it showed up in my yard, I though it was Bermuda grass. A closer inspection reveals that it has no runners like Bermuda grass and the inflorescence is different as well. Here is a picture from my yard (this is a small one, only 10 inches). 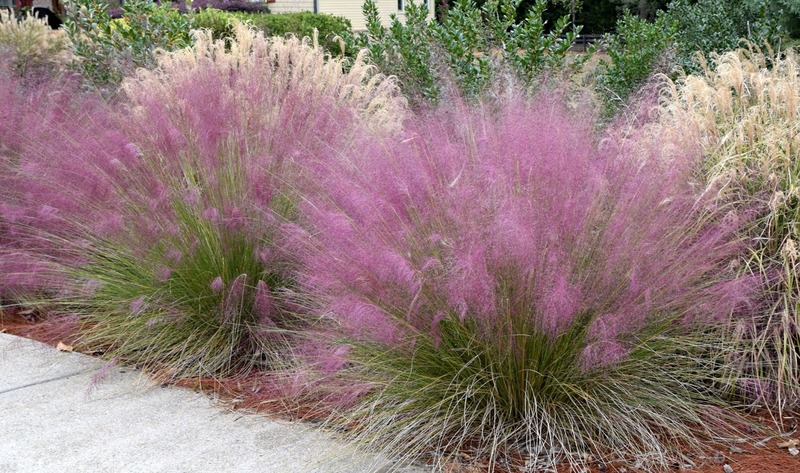 Muhly grass is but one of our southeastern native grasses being sold for landscape use these days. Schizachyrium scoparium 'The Blues' is getting a lot of attention and there are other choices. If you are looking for a larger grass, look to switchgrass and the cultivars of Panicum virgatum.